This is a Guest Post by Ashlee McCollum. Does your dog hate bath time? (For that matter, do you?) A little bit of strategy and patience can turn around this sometimes-dreaded ritual. Plus, you’ll get better results for your efforts. Your dog will be cleaner, smell nicer, and will maintain those fabulous looks! Make your dog’s bathing spot a fun place to be. Or at least one she doesn’t hate. Start by simply bringing your dog into the bathroom and rewarding her with treats. On another day, just run the bath water and reward her. Work your way up to a full bath over time. Check out the ASPCA’s in-depth instructions for more guidance. Whether you’re new or familiar with bath time, offer rewards during and after the process. Give constant praise and the occasional biscuit. Better yet, make it a habit to take your pooch on a walk or other fun activity when her bathing and grooming is over. Set aside weekend mornings as your designated bath time, for instance. Wash your dog from one end to the other. I suggest cleaning from tail-to-head. This way, you can be thorough and you’ll save the least favorite for last. Don’t apply shampoo directly to her head; soak it in water and rinse that on her noggin. Avoid tangles by properly drying your dog. Start with a towel and incorporate a (human or dog) blow dryer on medium or low heat. Get more out of your baths with regular brushing. Brushing helps remove dirt and dead skin, so do it once a week (less for short-haired dogs, more in some cases) and always right before baths. Personally, I’m a fan of the Furminator grooming brush. 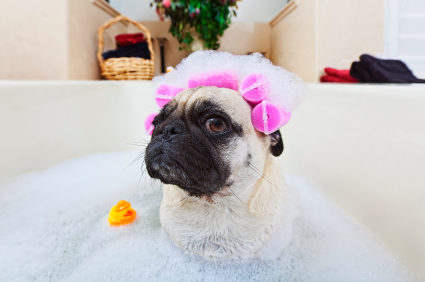 Do you have any “tricks” for your dog’s baths? Let us know in the comments! Ashlee McCollum is a staff writer for ApronAddicts.com, home of fashionable aprons and fun kitchen wear. Sorry, sounds nice and all but I luv swimming and water but no bath time for this pup! Don’t like the clean smell! Those are truly great ideas! Now if I can get my pooch to cooperate.